When the VW Beetle debuted, it was meant as a cheap car for mass consumption. Now, it is merely a large, retro, fashion accessory that makes some murky link to its origins. However, a true Beetle successor does exist, but it is only available in Europe. So the production Up has the usual front engine, front-wheel drive and torsion beam rear axle, but the engine is a new, all-aluminium, three-cylinder unit of 1.0 litre and either 60 or 95bhp. There will also be a 68bhp CNG version with just 79g/km CO2 when mated to the robotised manual transmission option. The Up is just over 3.5m long, weighs under a tonne (as you would hope) and has very short overhangs. At the front this is achived by mounting the radiator to the left side of the engine instead of in front of it. Not remotely rapid. The 1.0-litre, 75bhp, 108g/km, five-speed manual takes 13.2sec to hit 62mph and runs out of steam at 106mph, and you need to stoke the engine mercilessly to stay with torquey, turbodiesel-powered traffic. But, as with many three-pots, it’s a very likeable engine with a deep, smooth note and a response keener than than the figurtes suggest. Unusually for a triple, it has no balancer shaft. This small engine’s reciprocating masses are too low to need balancing. This is a light, airy car, beautifully made and detailed, and designed in the kind of industrial way that suits the painted-metal door edges and the lack of any padding. The dashboard is glossy, and body-coloured in most versions, and on it sits, optionally, a Navigon sat-nav/economy meter/control screen which you can take out and use, Tom-Tom-like, for on-foot navigation. It will talk to your phone, too. The Up! will not be coming stateside, but it is nice to know that there are useful, attractive, and cheap cars out there. 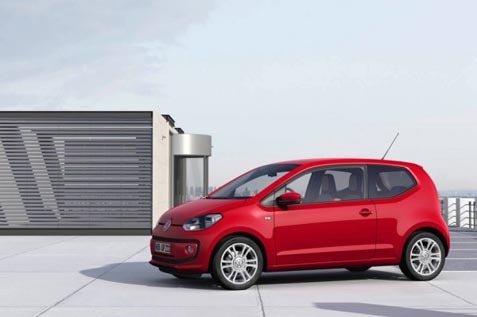 Tags: Evo, Volkswagen, Volkswagen New Beetle, Volkswagen new cars, Volkswagen news, VW, VW test, VW Up! 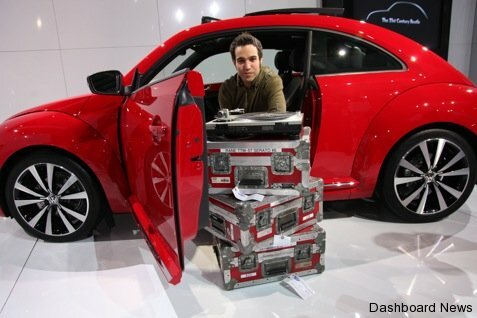 Jonathan Browning, President and CEO of Volkswagen Group America greeted media and guests from around the world alongside celebrity music artist and DJ Pete Wentz to unveil the third generation, 21st Century Beetle yesterday. The morning kicked off with a personalized spin session from Wentz featuring songs from longtime friend and business partner Travis McCoy, and of course hip hop selections. Cheering Volkswagen fans sipped mimosas and noshed on mini bagels, breakfast sandwiches, and other morning favorites. The sleek new 2012 Volkswagen Beetle, only the third generation of this beloved iconic car, showcases the company’s style, performance, and the latest advances in German engineering. The 21st Century Beetle debuted on three continents this morning starting in Shanghai, China followed by events in Berlin and Lower Manhattan. The event featured an introduction from Jonathan Browning and remarks from Luca de Meo, head of Global Marketing, and Klaus Bischoff, Head of Design for the brand. For more information on the 21st Century Beetle, visit vw.com or media.vw.com.